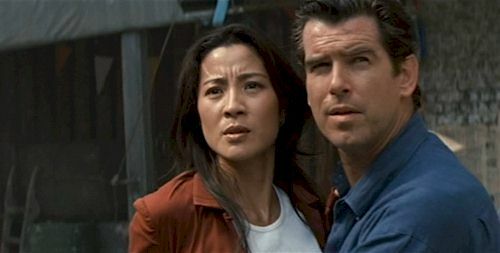 Michelle Yeoh and Remington Steele in Tomorrow Never Dies. The Skinny: Another action-packed entry in the James Bond phenomenon, this time, featuring Michelle Yeoh in her American debut. Also starring the guy from Dante's Peak. Review by Calvin McMillin: Pierce Brosnan returns as secret agent 007 in Tomorrow Never Dies, the eighteenth film in the highly successful James Bond film series. The plot is of typical Bondian proportions: in a novel bid to jumpstart World War III, delusional media mogul Elliot Carver (Jonathan Pryce) orchestrates an international tête-à-tête between merry, old England and Communist China. With neither side willing to back down, it's up to MI6 Commander James Bond to save the world. But this time around, Bond is teamed up with no mere bimbo: his Chinese counterpart, the accomplished secret agent Wai Lin (Michelle Yeoh) is every bit his match.